According to research compiled by Deal Point Data, the U.S. public M&A market had its best start to a year in more than a decade. The dollar value of newly announced M&A transactions involving U.S. publicly traded target companies increased by 16.3% to $249.9 billion compared to the same period last year. On a sequential basis, announced deal value accelerated 96.6% compared to the fourth quarter of 2018. The dollar value of M&A deals involving U.S. publicly traded target companies that closed during the first quarter surged by 140.6% to $191.1 billion compared to the first quarter 2018. 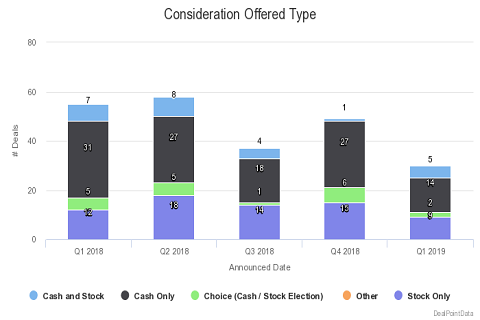 Goldman, Sachs topped the Deal Point Data investment banking league table for completed U.S. public target deals during Q1 2019 advising on $117.9 billion in deals. Skadden earned top honors in the legal market for the first quarter, closing $78.1 billion in U.S. public target deals to lead the legal market in the first quarter. 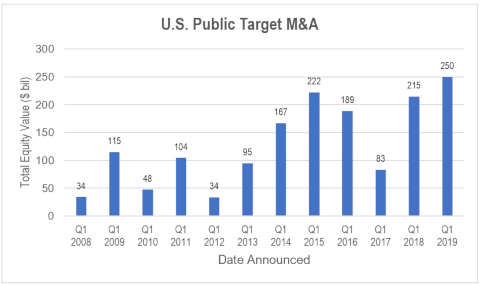 On newly announced U.S. public target deals, Wachtell advised on $110.8 billion in deals to earn the number one ranking. Wachtell, Lipton, Rosen & Katz was the top ranked legal adviser on U.S. public M&A deals announced in Q1 2019. Wachtell advised on 6 public deals valued at $110.8 billion. Kirkland & Ellis ranked second in the high-profile public M&A advisory market while Sullivan & Cromwell rounded out the top three. As of April 1, 2019, M&A advisory fees of $872.4 million have already been disclosed on U.S. public deals announced during the first quarter of 2019. JP Morgan led the market with $212 million in fees disclosed. Goldman, Sachs & Co. took second place among financial advisers. Centerview Partners rounded out the top three in disclosed fees. The number of new issues of SEC registered high-yield bonds fell by 48% in Q1 2019. The dollar volume declined by 50.4% compared to Q1 2018.